High Friction surfacing is a highly effective measure for the prevention of skid-related vehicle accidents and the associated financial and human costs. Antiskid surfacing has a range of safety benefits for both vehicular road users and pedestrians, providing a visual and audible warning for a variety of hazards, and helping to reduce speed and minimize skidding in dangerous conditions. The flexibility of antiskid surfacing makes it useful in a number of environments, for both traffic calming and demarcation purposes. The aesthetics of the products are often preferable for those looking for decorative surfacing, with five attractive colors – Red, Green, Blue, Yellow and Black to choose from. Type 1 is a hot-applied high friction surface dressing which is quickly and easily laid over both old and new road surfaces with smooth riding quality, keeping traffic disruption and traffic management costs to a minimum. The system dramatically improves skid resistance to saves lives through reduced braking distances and improved vehicle control. Type 1 surfacing is manufactured using 100% road grade calcined bauxite; an aggregate which re-profiles through wear, delivering a uniquely sustainable and durable surface ideal for use at heavily trafficked, high stress areas such as motorway slip roads, sharp bends, roundabout and pedestrian crossing approaches and accident black spots. Available in its natural aggregate colours of buff and grey, the material can be pigmented to provide enhanced visual segregation if required. It is therefore adaptable for use in projects such as cycle routes, bus lanes, traffic calming schemes, or anywhere Type 1 values are specified. 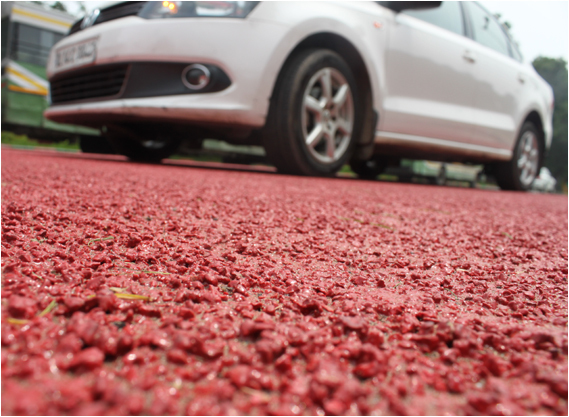 ColourTex is a pigmented skid-resistant thermoplastic surfacing material which is ideal for use in the delineation of areas such as bus lanes, cycle lanes, give-ways and in traffic calming schemes. It is the perfect solution for urban and rural networks, providing a durable, maintenance-free and colourfast surface that can be trafficked 15-20 minutes after application. The use of skid-resistant coloured safety surfacing helps to reduce accidents through visually reinforcing the message of conventional road markings & signs. ColourTex is a tough, durable material and is suitable for installation all year round. It can be laid on both old and new asphaltic surfaces with smooth riding quality. Bends (Radius < 500m) on all type of roads. Sites with gradient greater than 5%. The normal surfacing materials cannot provide the required friction (or PSV) for the said locations. So there is a need of high friction surfacing on these locations. Antiskid helps to reduce the breaking time and therefore assist in minimizing accidents and collisions. Antiskid is highly durable and can withstand vast amount of traffic, weather conditions and other stress. It is also resistant to material such as oil, fuel and solvents ensuring that it maintains the antiskid qualities despite accidental spillages. Antiskid can also be used for decorative purposes. With a choice of red, green, buff, grey and black antiskid, many companies and domestic customers find the surfacing an attractive, cost effective and low maintenance choice of driveway, car park or pathway. Type 1 and Colortex are Hot applied high friction surface dressing which can be quickly laid under all weather extremes/conditions throughout the year. Great Antiskid feature with less thickness and light-weight enables it not to increase the loading of roads and bridges or the headroom of tunnels and height-permitted sections. Single Vehicle Operations results in low operational area requirements thus causing minimal disruption to the traffic and least inconvenience to the commuters. Convenient technology with low maintenance cost, much cheaper than any other solutions. Why is It Green/Environment Friendly? Our antiskid surfacing has low toxic level that is why it is environment friendly. The products with reflective aggregates can prove effective in improving the visibility in urban areas where street lighting can be removed or reduced to lower the consumption of electricity with the aim of reducing the carbon footprints. Containing no solvent or lead therefore it is harmless and environment friendly.